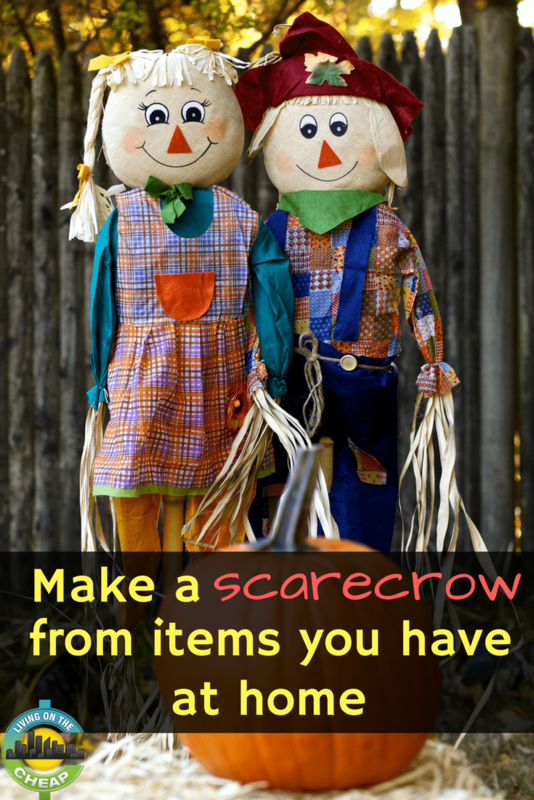 For less than $20 you can purchase a ready-made scarecrow-on-a-stick from a craft store. 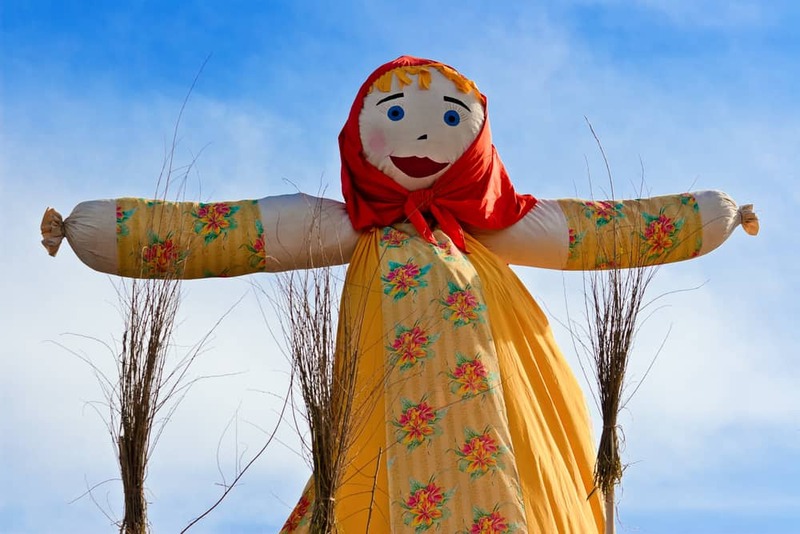 Or, you can make your own one-of-a-kind scarecrow mostly using materials you have at home. Safety pins and/or various lengths of rope. Burlap sack or pillowcase for face. Markers, paints or needle and thread to create facial features. Yarn or straw for hair. Leaves or quarter-bale of straw for stuffing (about $8 a bale at garden centers). 6-foot T-post (available at Home Depot for less than $6). 4-foot length of scrap lumber for horizontal support (about $1 at hardware stores). 10 feet of wire or twine. Used coveralls, long-sleeved shirt and overalls, or shirt and pant, or shirt and skirt with bloomers. Tools: sledgehammer or post pounder; wire cutters; pliers; hammer and nails. 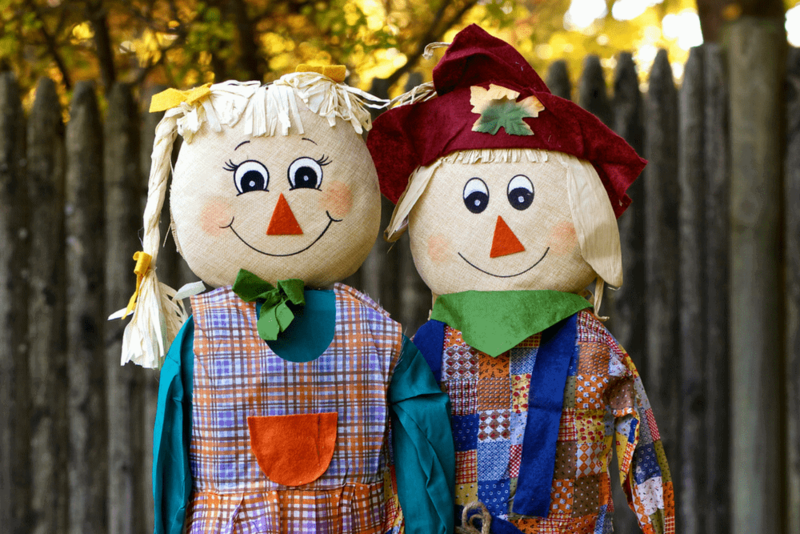 Lay out clothing as you want it to look on your scarecrow (i.e., place shirt inside overalls or tuck into pants). Secure clothing items together using safety pins and rope. Tie off lower pant-leg openings with rope. Draw, paint, or stitch face onto sack/pillowcase. Stitch or glue yarn or straw “hair” to sack/pillowcase. Stuff scarecrow body, head, and glove “hands” with leaves or straw. Keep stuffing until limbs are full but slightly malleable. Insert wire hanger into straw in scarecrow’s chest and shoulder area, leaving top of hanger protruding in place of neck. Attach head over top of hanger, using wire or twine to secure head to body. Pound t-post into ground with sledgehammer, leaving 5 feet of post above ground. Secure scrap lumber support bar to t-post with wire. Prop scarecrow against t-post to determine placement height for support bar. It should align with scarecrow’s arms. Secure scarecrow to post and support bar with wire and/or twine. Place bottom of scarecrow’s legs inside shoes and secure hat to head. Once you’ve mastered the basics of scarecrow-making, try your hand at a themed scarecrow display using repurposed home and garden items. You’re only limited by your imagination. 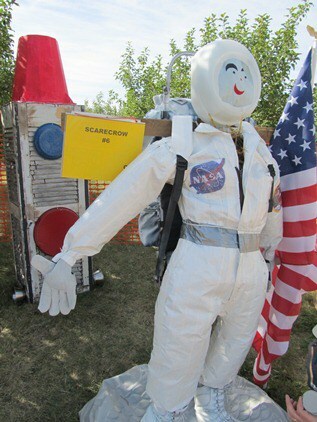 For example, our family crafted this Neil Armstrong scarecrow from a duct-taped hunting coverall, spray-painted snow boots, a broken vaporizer for the helmet, an old hiking backpack, an upside-down kiddie pool for the moon, and old window shutters topped with a Styrofoam rosebush cover for the rocket. Kim Kankiewicz writes fundraising and marketing communications for nonprofit organizations and ghostwrites executive articles and speeches. Her byline has appeared in Brain, Child magazine, The Saint Paul Almanac, MinnPost and Denver’s Westword weekly. Kim is a seasoned re-user, upcycler, and secondhand shopper. Her favorite discount purchase was the wedding dress she found for $25 at Savers, which she wore when she married her equally frugal husband.